The things John Wall sees are largely beyond us. While surrounded by giants and operating at preposterous speeds, Wall manages to track every passing angle available to him. Those angles are evolving constantly. Wall darts around the floor, often lunging for quick bursts through entire layers of defense at a time. His fellow Wizards are cutting, screening, and oscillating between spots. And with every action comes some defensive reaction—changes in positioning or in assignment to reckon with the fact that Wall is so fast that he can move anywhere he wants to go. Somehow, a glance is enough to capture all of that information and anticipate every change. Wall has always been a supernatural passer. This season, however, Washington’s guiding star has redeemed his extraordinary vision to tap even further into the unexpected. There is no more surprising playmaker at work in the league right now than Wall. Just when an opponent would expect Wall to pull up for a shot, he drops a chest-high bounce pass to a rolling Marcin Gortat. Scramble to stay in front of Wall at the top of his drive, and he’s likely to whip a pass through the lane when any other guard would rev up to attack. …could any defender reasonably predict that Wall would look off an open Markieff Morris in the strong-side corner, turn his body in mid-air as to convince the defense that he might pass to Morris, glance back out to a covered Otto Porter at the three-point line, and then 180 his way into a drop-off for Gortat, whom Wall sprinted past at the start of the play before Gortat could even get his screen set? No player on the floor has a vantage point this clear, and yet they’re expected to keep up with plays well beyond the scope of standard development. This possession, for example, looks like a standard side pick-and-roll with an additional screen on the opposite side of the floor to free up Bradley Beal. 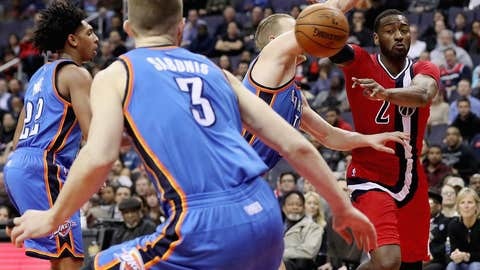 Washington’s playbook is layered thick with this stuff; Scott Brooks has made sure that opponents will have to dig their way out of their defensive confusion—sorting out impromptu help rotations on the fly, even as the principals are screened and re-screened—to have any chance of stopping Wall off the dribble. Wall takes a different path. Splitting the defense allows Wall to beat both of his immediate defenders to the rim, though 6'10″ Noah Vonleh is just involved enough to encourage a pass. The obvious read is to Beal. Allen Crabbe does a good enough job tracking Beal to at least put himself in the way, which leads Wall to shift his attention to the opposite corner mid-jump. Wall, with a cross-body pass, capitalizes on the only help that came on his drive to set up an open three for the league’s top three-point shooter. It’s getting ridiculous. Washington runs a smart offense and has the kind of wide-ranging ability in its starting lineup to flummox opponents. Wall is often the agent of that flummoxing—a creator who can compromise a defense with a breeze through the paint, only to then set up the one teammate a defense would never expect. All of the natural prioritization that informs a defense’s principles is undone by the fact that Wall can see right through them. Wall can do that in his sleep. He freezes a defense—not a defender, an entire defense—with a look. And just as it clicks in an opponent’s mind that some misdirection could be in play, a sharp pass down a lane no one knew existed turns a possession on its head.